Grace Pacific Precast Inc. unveiled its new precast "kwik" road pavers invented by a local engineer, Alfred Yee, president of Applied Technology Corp. Grace Pacific will make precast concrete that can be trucked to a construction site and finished in three days. 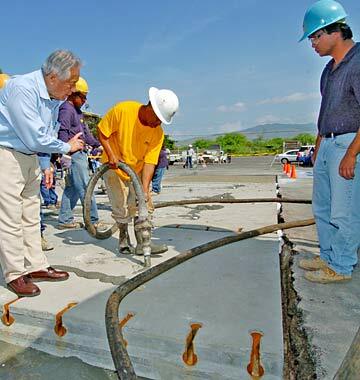 During a demonstration yesterday, Yee, left, talked with Charles Matthews as he used a hose to fill precast areas with concrete. The 204-room Aloha Surf, a budget hotel two blocks from Waikiki Beach, will get a $2.5 million upgrade in preparation for it to sell individual units. Rooms will get custom furniture, flat-screen televisions and wireless high-speed Internet access. The property's open-air lobby will get new carpeting, paint, furniture and artwork. Design plans also call for upgrading the swimming pool furniture and adding a spa. The conversion is expected to be completed in about four months. Rooms at the Kanekapolei Street property will be sold to individual owner-investors, who may choose to put the units into a hotel rental pool. Aqua Hotels & Resorts, a Waikiki-based company that specializes in managing condominium hotels, will be one of the property managers. HOFFMAN ESTATES, Ill. » Changes are on the way for Kmart and Sears stores following the merger of their parent companies, but widespread store closings won't be part of them. So declared Edward Lampert, architect of the $12.3 billion merger that became reality yesterday and gave birth to Sears Holdings Corp., which he now chairs. Minutes after a rancorous shareholders' meeting where Sears, Roebuck and Co. retirees denounced the 119-year-old retailer's sale to Kmart Holding Corp., Lampert stated his intent to reinvigorate the two faded retail icons and "transform them into a great company." "I think either company on its own could have been OK," said Lampert, who was Kmart's chairman and the largest individual shareholder in each retailer. "But I don't think either company could have been ... a great company." Seibu Railway Co., owned by one of Japan's wealthiest businessmen, said it's aiming to raise $3.8 billion by selling assets and seeking investors to help pay 28 percent of its debt in four years, part of a plan to reorganize its real estate and railway businesses. Seibu, based in central Japan's Saitama Prefecture, will take over the real estate business of its parent Kokudo Corp., including the Prince Hotels chain, according to a statement today by a committee appointed by creditors to overhaul its business. Seibu will invest $1.4 billion over three years to renovate its hotels, railway stations and other properties, the statement said. The reorganization of Seibu and Kokudo is the latest move by the railway company to return its stock, expelled from the Tokyo exchange on Dec. 17, to the bourse. Seibu is aiming to re-list its stock by 2008 to tap the capital markets for funds. The move follows months of investigations by Japan's securities regulator into the stakes held by former chairman Yoshiaki Tsutsumi, who was ranked as the world's wealthiest businessman in 1990 by Forbes magazine. Tsutsumi, 70, was indicted this week on charges of fraud and insider trading, after he persuaded other companies to help hide Kokudo's Seibu stake. Seibu's shares were expelled after Kokudo and its affiliates admitted to owning more than 80 percent of the railway company, an ownership that breached the Tokyo exchange's listing rules. » Ogilvy & Mather Hawaii Inc. has hired Connie Ho as senior account executive. She will be responsible for handling the day-to-day activities of the TD Food Group account. She most recently served as the line producer to Nash Entertainment's reality show "For Better or Worse." » Peter Vincent & Associates LLC has hired Minatsu Suzuki as an interior designer. She has over six years design experience in Hawaii's hotel/resort, retail, office and residential arenas. >> Trex Enterprises has hired Wes Freiwald as Trex Hawaii vice president and Maui operations general manager. He has nearly 20 years of technical management experience in all aspects of several multimillion-dollar aerospace projects. He most recently served as the Maui Space Surveillance Site director and program manager. » The Westin Maui Resort & Spa has hired Casey Cordero as sales manager. He will be responsible for booking group business primarily from the East Coast. He previously served as the Ritz-Carlton Kapalua sales assistant. » Tiki's Grill & Bar has appointed Michael C. Miller sales manager. He will be responsible for overseeing the sales, marketing and public relations functions for the restaurant. He has over 17 years of sales, marketing and public relations experience. » Hilton Waikoloa Village has hired Ashley Nakano as executive pastry chef. She will be responsible for supervising day-to-day operations in the hotel's pastry kitchen. She previously served as the pastry chef of the Four Seasons Resort Hualalai. » The state Department of Education has appointed Gerald D. Okamoto assistant superintendent for its Office of Human Resources. He previously served as the Verizon Communications Inc. executive director of employee health, safety and environment in New York. » SMG Hawaii has hired Ron Adams as Hawaii Convention Center sales and marketing senior director. He will be responsible for overseeing the center's sales and marketing division, strengthening past and existing client relationships and serving as the center's liaison with the Hawaii Tourism Authority. He previously served as the Candon Consulting Group LLC executive vice president. » The JW Marriott Ihilani Resort and Spa has appointed Eleni Espania to reservation sales director. She will be responsible for overseeing the reservations department and revenue management for the resort. She most recently served as sales manager for Marriott's Hawaiian Island Hotels & Resorts cluster sales office. » Hawaiian Waters Adventure Park has promoted Sean Gano to marketing executive. He will be responsible for serving as the company spokesman. He joined the company in 2002.